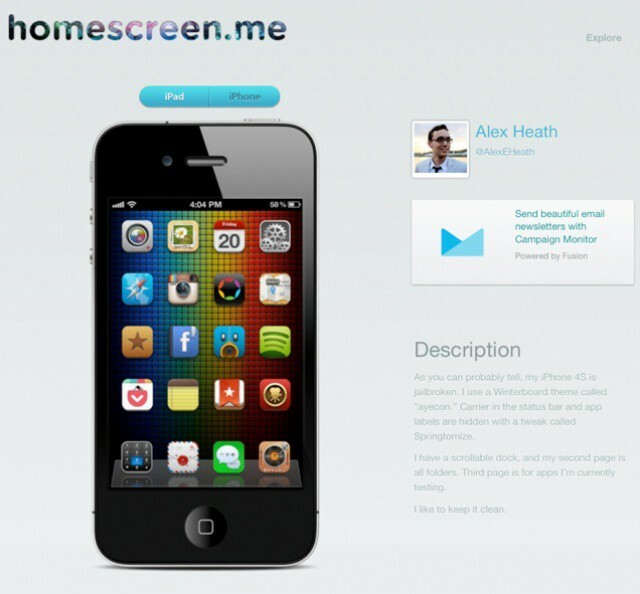 Homescreen.me Is Finally Out Of Beta. Time To Share Your iPhone And iPad Setup With Us! I’m gonna be honest. I totally forgot that Homescreen.me existed. That’s because the website has been in private beta for two years, and I stopped using it after I initially uploaded my iPhone’s Home screen in 2010. So, I after finding out that Homescreen.me has opened its doors up for everyone today, I logged back into my account. Seeing the main apps I used on my iPhone 3GS at the time brought back a flood of memories. There’s something very personal about a Home screen. It represents the apps that are most special to you. But those apps change over time. After logging back in, I uploaded my current iPhone and iPad Home screens. It was interesting to see how my layout changed two years later and what new apps had been given first page priority. I then shared my current setup on Twitter for my friends to check out. That’s what Homescreen.me is about: sharing and discovering great Home screens with fellow geeks who love their iOS devices. 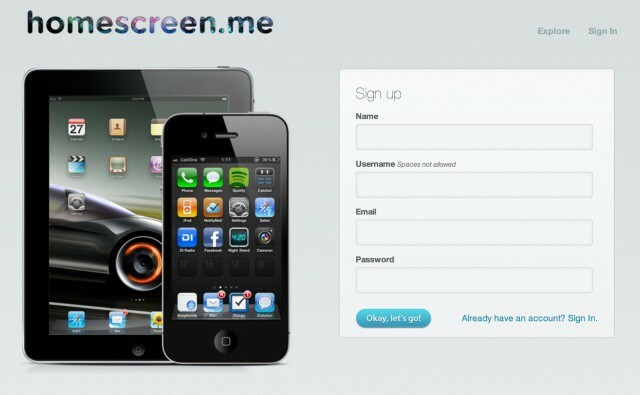 Once you create an account, upload screenshots of your iPhone and iPad’s Home screen. If you just have one device or don’t want to share both, then only upload one. There’s no pressure. Add a short description and you’re done. Now others can check out what apps and wallpaper you use on your iOS device. A cool feature of Homescreen.me is the ability to look at other people’s Home screens. The “Explore” tab lets you browse accounts, including staff picks and popular users. You can also search for Twitter handles you follow to see if they have shared their Home screens. I have to admit that the site can be improved. It would be nice to see some Twitter integration for finding users in a list and sharing Home screens you think are cool. Two years later, Homescreen.me still feels very barebones. The clean design is nice, but there’s plenty of room for growth. I noticed some slow load times today as well. There’s something special about sharing your Home screen with the world. In a sense, it can be pretty revealing. But it can also be very rewarding to know that you helped someone find a cool new app or wallpaper. And who doesn’t enjoy discovering new apps and Home screen layout ideas for themselves? We want to see what apps Cult of Mac readers are rocking on their iPhones and iPads! Go to Homescreen.me, sign up, and post the link to your account in the comments section below. We’ll compose a reader-submitted gallery of awesome Home screens and post it on the front page of Cult of Mac!